The government of El Salvador has yet to provide a convincing response to allegations that senior officers of the national police created criminal networks within the institution that engaged in extrajudicial killings, sexual assault and extortion. The allegations resurfaced following an investigation by Revista Factum that revealed how four police officers in the Special Reaction Forces [FES] of El Salvador‘s National Civil Police [PNC] allegedly participated in three extrajudicial killings, as well as the possible sexual assault of two adolescents and at least one case of extortion. The report also delved into the existence of internal communication networks in which dozens of high-level police officers exchanged information to facilitate the killings of gang members or to tamper with crime scenes in order to make executions appear to be justifiable killings. Following the publication of the investigation, Police Director Howard Cotto announced the arrest of the four policemen involved, as well as the opening of an internal investigation. Cotto said that he had also advised the Attorney General’s Office of the investigations. On Aug. 28, Attorney General Douglas Meléndez announced that he had also opened an investigation, but did not specify whether or not he would charge the police officers with any crimes. A few hours after publication, the Salvadoran journalists who wrote the report began to receive threats from websites controlled by the police or even managed from within the State Intelligence Agency. This is not the first time that police and prosecutors have said they will look into this type of case. But it is the first time such a case directly involves the FES, the elite unit of the the police created during the current administration of Pres. Salvador Sánchez Cerén with the explicit mandate of fighting the country’s gangs. And the reporting raises serious questions about whether the unit’s chain of command knew about the alleged illegal activities. Police officials told InSight Crime that the chain of command of the special forces unit includes the head of the FES and the deputy director of special forces of the police. So far, however, the investigations have not resulted in any convictions or dismissals for the officers allegedly involved. The first allegations against the police during the Sánchez Cerén administration came in July 2015 when the Salvadoran online outlet El Faro published an extensive report on a massacre perpetrated by members of the police in the San Blas estate, in the central department of La Libertad. More reports followed soonafter. La Prensa Gráfica reported another massacre in Panchimalco, on the outskirts of the capital city of San Salvador, and Revista Factum reported the murder of a disabled man in the mountainous zone of Saragossa at the hands of police. In each of these cases, the response of the Salvadoran government was non-committal. The shadow of death squads has long lingered over the Sánchez Cerén administration. As part of the Farabundo Martí National Liberation Front, Sánchez Cerén began his presidential term in 2014 with a public policy targeting the MS13 and Barrio 18 street gangs that included secret dialogue with leaders of both groups. InSight Crime, Revista Factum and El Faro revealed that some of those conversations involved gang leaders who the incumbent party offered money to in return for support in the elections. Very soon thereafter, and without entirely discarding surreptitious talks with the gangs, the government opted for direct confrontation with the gangs and the creation of elite units to pursue suspected gang members in neighborhoods, towns and cities where gangs exercised some measure of territorial control. One of the main tools used for this purpose has been the special police forces grouped together with members of the military in the FES. The deployment of the FES also occurred within the framework of the extraordinary security measures promoted by congress with a push from the executive branch, which included the indefinite use of the military in matters of citizen security, tightening prison restrictions and opening space for misconduct in cases related to gangs, which the legislature had previously declared terrorist organizations. Shortly after the deployment of the FES, allegations began to surface that some policemen were executing suspected gang members, and with the consent of mid-level commanders, tampering with crime scenes to make it look like the deaths were the result of a confrontation or shooting. 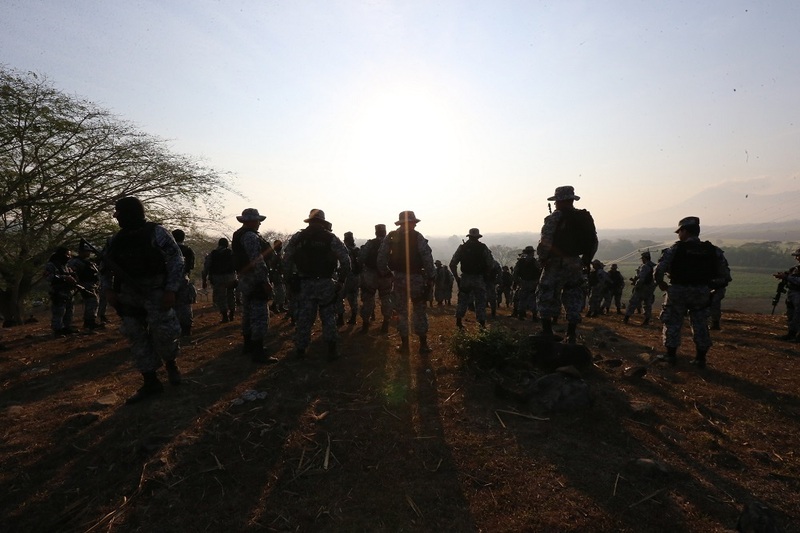 As a result of this policy, alleged armed clashes have been increasing in El Salvador since 2015. Between January and Aug. 21, 2017, 293 gang members have been killed in 346 gunfights, according to PNC Director Cotto. While no police officers were killed in these clashes, 17 officers have been killed at the hands of gang members in 2017. After the first investigations were published, the international community voiced concerns that the Salvadoran government was tolerating, or even encouraging, an extermination policy. The Sánchez Cerén administration has always said that these were isolated incidents and that the death squads were almost always formed by civilians who supported self-defense groups. The authorities have always denied that the extrajudicial execution of suspected gang members is an institutional policy or, much less, a state policy. Vice President Ortiz repeated this sentiment on a radio show on Aug. 28. But this time the revelations are clearer and more serious. They show that the alleged perpetrators of the crimes are part of a group that acts within the police. Moreover, the group exists within an elite unit endowed with extraordinary resources and directly supervised by the presidency.